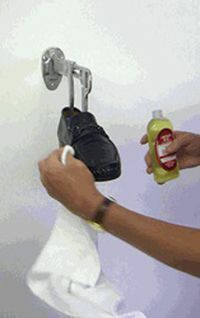 Step 1 Wash down shoes. Apply cleaner to a wet cloth. Rub briskly onto leather to work up a lather. Use a damp cloth to wipe away foam and dirt. Towel dry. Cleaner solutions such as Lincoln EZ Cleaner are recommended because they are formulated to the proper PH for leather to prolong the life of your leather goods.